In Maputo, I visited Kepa’s country office in order to find information on civil society, corporate responsibility and the extractive industries in Mozambique. I had the perception that after the independence of 1975 and a long civil war, the last 20 years of civil society organisations (CSOs) in Mozambique have included interesting eras and difficulties according to the funding, local politics and (inter)national partnerships. After discussing Kepa’s 2013 report, I thought that a closer examination of the current possibilities and challenges of CSOs might reveal interesting aspects of development co-operation and its value. Here you can read my interview with Kepa’s employee, Leopoldino, who I met in Maputo. For background information, you can read my earlier blog post in Finnish and Kepa’s report in English here. One example of a Mozambican CSO is Justiça Ambiental. 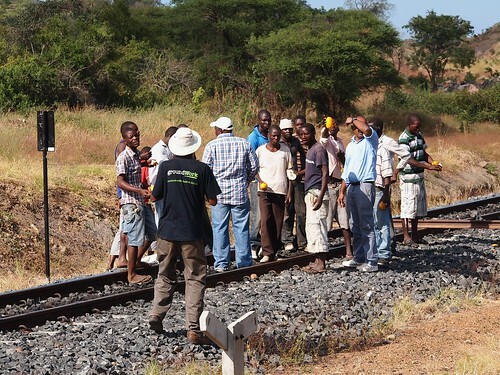 Here one of its employees takes photos of the brick-makers, who cut the railway connection of a major extractive company Vale in 2013. Photo: Kepa/Henna Hakkarainen. 1. Could you tell us your name and background? When and why has your position in Kepa been created and how did you end up in this job? I am Leopoldino Jerónimo, a country program advisor for strengthening the civil society. I have been in the civil society work for about 8 years. Before joining Kepa in April 2015, I was working in the northern province of Cabo Delgado and interacting with Kepa through other national and international organisations. Kepa’s online job announcement felt exactly like something I wanted to be all this time. However, I also had a drawback, because I felt that the civil society was different from the one 5 years earlier and definitely different than the one soon after independence. I also recalled several observations of the political situation that the civil society, especially outside the capital city, is not so into systematic advocacy. At national level there were CSOs coming and going under the title of Network, platform and forums. At local level there where provincial forums with thematic groups, associations and interest groups, who tended to work against one another to gain political prestige. I considered the job as an opportunity to take part in the change I had always found possible. 2. Kepa’s 2013 report from Mozambique lists many shortcomings for the instruments, democratic participation and cooperation of CSOs, which have derived from the hostile government and the CSOs themselves. Which continue being the biggest challenges? The results from the major studies about the civil society in 2015 show that the problems still remain. One of them is political contest which has shape-shifted but prevails not being the best of examples to follow. However, from a chronological perspective of 20 years, it can obviously be said that we are good these days. Of course the goal is not to satisfy ourselves with minimum conditions but try to build a country where open-minded individuals or CSOs are free to express their views about issues concerning the country status. It’s a shame that some of the CSOs are funded to set back the work of independent thinkers who publicly point out facts that are not pro government or some political party. It’s a pity that instead of open debate on an issue of public interest, people in powerful institutions are twisting the message and starting a debate about the person’s background and political affiliation, as if there was just one political party owning the good opinions and others being evil. It is still a concern that political activists or critical journalists are chased or openly killed, followed by no serious investigation and rumours saying they were ”dealt with” so that the ruling regime prevails. The political tension of the past few years is compromising achievements of democracy and active citizenship, bringing back intimidation to the people who are supposed to trust their leaders regardless of the political party. Looking at CSOs effective continuity, the financial capacity has also been pointed out as a limitation. The most crucial aspect, however, appears to be the lack of commitment to their mission. Instead of specialising in a particular area of expertise, there is a group of CSOs that might shape-shift at any given circumstance and chase funding no matter the level of integrity of the source. These organisations are weakening themselves because they end up misused for other agendas. 3. There must be successes, too, when examining Kepa’s work with Mozambican CSOs and officials in the past few years. Could you name two or three particular examples of influential outcome or improved areas of work (citizen awareness, network, report, conference, law etc.)? Along the years some organizations recall Kepa as being one of the international organisations who have contributed to a dynamic civil society engagement. There have been financial and technical contributions for a few advocacy campaigns such as the process of changing the family law, the law of right to access of information as well as the law against benefits for the members of the parliament. Kepa has repeatedly joined the supporters of civil society spaces where CSOs represent the people’s interest for National Development Observatories (earlier known as poverty observatory) under the G20 civil society network. Kepa has also repeatedly contributed to the consecutive national CSO conference organised by JOINT, an umbrella organisation where the roles and interests of the civil society are discussed. The good thing about Kepa’s basket funding approach is that Kepa partners up with CSOs and contributes to their strategic plans but it does not give any specific external agenda dictating what to do and how. This means different but like-minded organizations can bring their financial contributions together so that a given CSO can implement its strategic plan in ways the members consider being the best. 4. Evaluating the quality and outcomes of CSO work and social impact is difficult but necessary, and it has been debated now that development aid is being cut. What kind of reporting and indicators are used in Kepa? How do cuts by the Finnish government affect the work of Kepa and Finnish NGOs in Mozambique? Unfortunately Kepa recognises that its financial contribution has not been the major one for every local partner compared to other international NGOs. However, Kepa does not identify itself as donor only but as a partner who is informally and physically accessible whenever needed. Partners recognise that technical assistance has been Kepa’s strongest input and that it helps out discussing positioning papers and advocacy actions with global inputs that might locally be highly important. As a result of the cuts in development co-operation, it is difficult to imagine successful support with a 50 % cut in the annual budget. In order to maintain the financial support to some partners and expand to some strategic ones, Kepa reduced its staff in Mozambique from 8 to 3 people (two program advisors and one office manager). Luckily there are strategies to maintain the current or improved levels of impact, and the partners proposed for the transition period of 2016 are some of the most active CSOs and platforms. This will enable Kepa to smoothly exchange energies advocating a better world in the Global South. 5. Besides CSOs and INGOs, does Kepa collaborate with companies and private sector? Why / why not? In Mozambique Kepa does not directly collaborate with companies and private sector. The main reason is that Kepa does not do advocacy on its own as it does in Finland. In the South, Kepa seeks to strengthen the capacity of local CSOs so that with their own evidence and reasoning the CSOs can take advocacy actions towards the national authority on behalf of citizens, whose interest they claim to protect. Kepa can be seen as a critical friend that helps different civil society actors to stimulate deep thinking and collaboration. It is important to notice that in Mozambique the partnership between civil society and private sector is still not taken into consideration as a fruitful option, because along the years private sector has partnered up with the government and this has been seen as a conflict of interests in CSOs’ eyes. Perceptions change little by little and in some companies there is a slight trend that the future might be different. However, in the near future it might not be possible to form favourable partnerships. Thanks to the article of Kepa’s other employee Lucia Jofrice, we can get a better understanding of this problematique. 6. There is a little bit of time and a new government since Kepa’s 2013 report. Has something changed in the working environment of CSOs? How do you see the future of CSOs in Mozambique? It is still too soon to name direct changes as it all seem to be a fragile environment for both the government and civil society relations. Thanks to the Enabling Environment National Assessment of CSOs – the case of Mozambique assessment from 2015 we are able to understand that there truly is still a long way to go. Starting from the perceived gaps in the law of associations, there are issues in need of revision, especially the effective recognition of the severally jeopardized freedom of expression and press. The assessment also points out that CSOs do not have equal systematised financial opportunities. This is believed to be influenced by a very messed up political environment that favours CSOs who follow the interests of the government or the ruling political party. Despite the unpromising results, most recent CSO studies see that the future can be brighter. We’re on the way to a more open society in which people once in a while speak up for themselves and movements of change are raising. In this process we have the important role to support CSOs not to walk the uncoordinated and unnecessarily competing path.